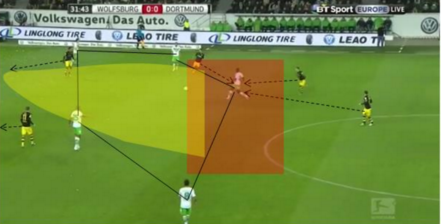 Miles Olusina provides a detailed tactical analysis of the Bundesliga game between Wolfsburg and Borussia Dortmund. The two leaders of the chasing pack came head to head in this encounter. 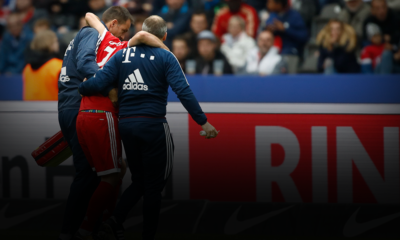 Both teams were galvanised by Gladbach’s shock 3-1 victory over runaway leaders Bayern Munich and were eager to close the gap on the Bavarians. Despite Wolfsburg’s phenomenal home record prior to this game (29 league games unbeaten), Thomas Tuchel’s reinvigorated Borussia Dortmund side were many people’s favourites going into this game with striker Pierre-Emerick Aubameyang in lethal form with 17 goals in 14 Bundesliga matches. 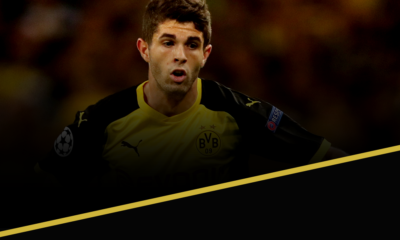 Both sides were without key players, Wolfsburg were unable to rely on Dante who was absent through suspension while BVB were missing centre-back Mats Hummels who was replaced by Sven Bender; a peculiar decision at first but one which seemed to make more sense as the game wore on and proved to be problematic for Wolfsburg. 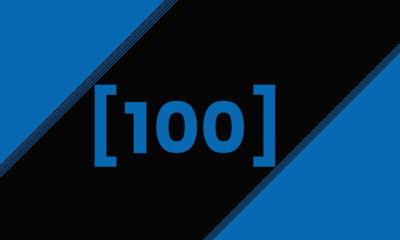 It was a game that could have gone either way but Wolfsburg’s lack of central orientation and an inability to create a stable positional structure proved to be a decisive factor. This, along with Dortmund’s pressing traps and constant penetration extended Dortmund’s lead in 2nd place to 9 points and sent Wolfsburg out of the top 4. With Dortmund’s system allowing them to gain numerical superiority centrally, Wolfsburg were forced to overload the wide areas. Often times both ‘strikers’ Schurrle and Kruse would drift into the channels in wide areas, looking to create even more superiority out wide. It rarely paid off however, as Dortmund set up pressing traps in the wide zones which allowed them to capitalise in the transition phase. 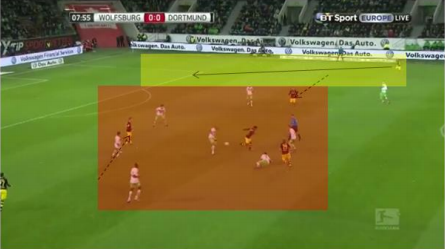 The above image is an example of Wolfsburg being pressed and denied central access from wide areas. Here, Vierinha receives the ball out wide and attempts to move into the half-space which is immediately overloaded by three Dortmund players. 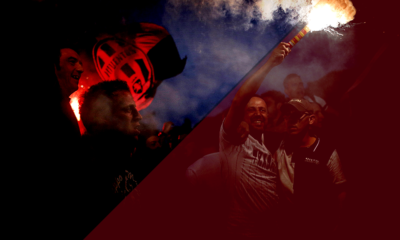 Eventually possession is lost and Dortmund aim to transition. 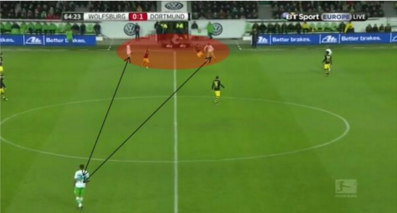 Wolfsburg were rendered ineffective for large spells of the game, however, it was as much to do with Dortmund’s compactness and intelligent structure in the defensive phase as Wolfsburg being poor structurally in the attacking phase. Wolfsburg were guilty of this too often during the game. 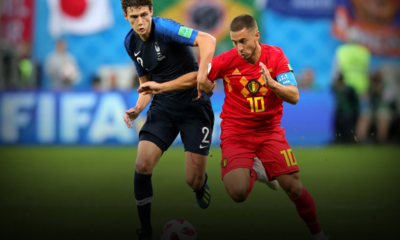 Their focus on the wide areas led to a criminal amount of distance between players in their shape and as a result, meant they were unable to circulate the ball effectively instead relying on switches of play and long-range passes. 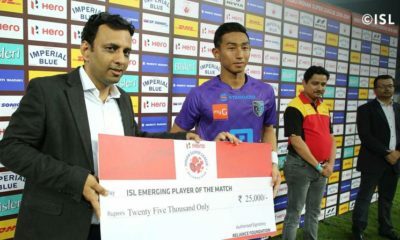 The movement of the 6s, Guilavogui and Arnold and the two strikers, Kruse and Schurrle did little to aid this and in fact it worsened when Guilavogui was removed at half time and Arnold anchored the midfield by himself. 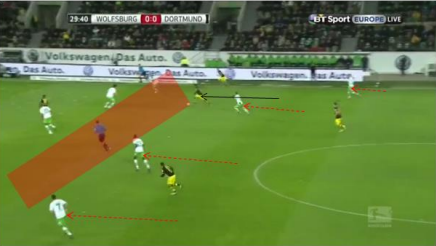 Dortmund appear to have the substantial overload in this phase of the game, however Wolfsburg’s poor structure which is shaped around the Dortmund block instead of through it makes it much easier for Dortmund to defend against; as they rarely have to shift vertically and individual players do not have to deviate from their position due to no Wolfsburg player being in an effective position between the lines. Arnold is ineffective in this phase as his passing lane is being blocked by Mkhitaryan and his teammate in the half-space is in the cover shadow of Gundogan. 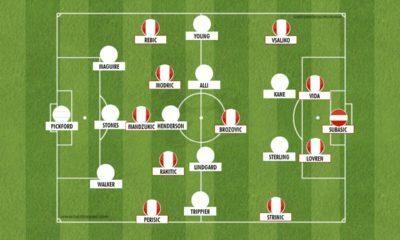 Their 4-4-2 shape with two free-roaming strikers could easily have proved advantageous had they chosen to move between the lines and connect play instead of focusing primarily on the wide areas. They would have been more than capable to drifting into the area between the back 4 and the Dortmund 6s, Ginter and Gundogan. 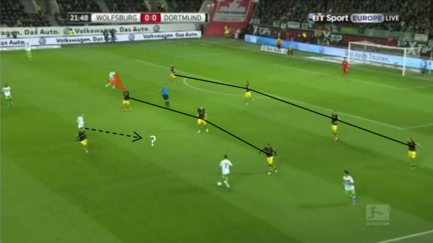 The image above shows how Wolfsburg could have set up structurally. In this image, Vierinha at right-back is in possession but this time has a central and wide option. 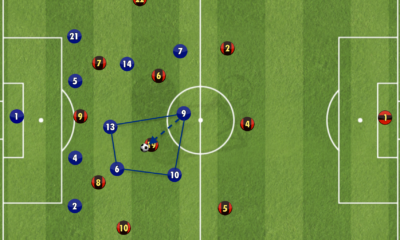 The players are staggered effectively allowing them to form triangles and create combinations on the field and Draxler is providing penetration in the left half-space. Schurrle is between the lines with Kruse giving the team depth but still able to drop deep into the Dortmund 6 space and open up gaps in the opposition back line. 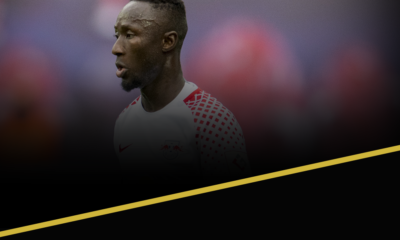 Their shape was also detrimental in the build-up phase and played right into Dortmund’s hands as they capitalised to score the first goal in the 32nd minute. 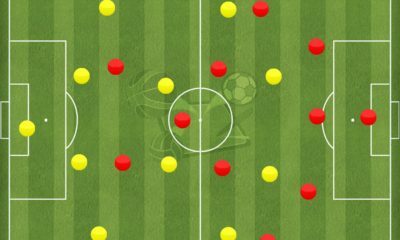 The pressing trap set up by Dortmund could have proved much less decisive had they been set up properly and not left an excess amount of space centrally as seen in the yellow shade. Ricardo Rodriguez, at left-back was Wolfsburg’s deepest man which meant no cover for the defence in central areas should possession be lost. 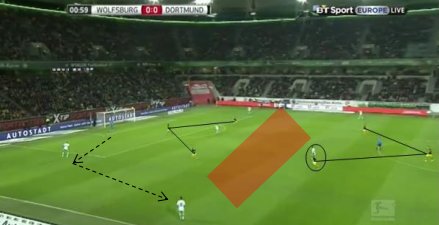 Had Naldo been deeper, providing cover the situation may have not resulted in a Dortmund goal. Aubameyang and Reus are quick to exploit the space left by the Wolfsburg back 4 and take the lead. Part of the key to Dortmund’s victory was their ability to vary the way in which they attacked against the Wolfsburg defence. 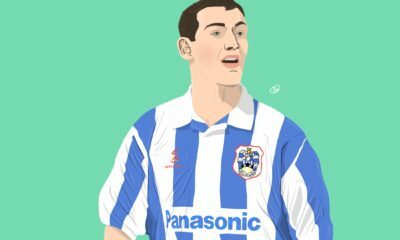 In possession, at times they could be seen overloading the centre in order to create space for 3rd man runs from the full-backs in wide areas, which led to a few good opportunities that they could have capitalised on. Intelligent movement from the attacking 4 of Aubameyang, Reus, Mkhitaryan and Castro allow Piszczek out wide on the right to make a run into the box which very nearly leads to a Dortmund goal. Aubameyang drops deep into the 6 space from his number 9 role, which in turn causes Naldo to follow him in order to prevent an overload in midfield. This, along with Mkhitaryan’s movement into the half-space, means Rodriguez must shift centrally. Reus drags Vierinha central also, giving them the option of penetrating from the left hand side as well as the right. On occasion, they would adopt a more patient approach and circulate the ball in order to break up the lines of the Wolfsburg defence. And in this instance it nearly paid off when Aubameyang played in Mkhitaryan who was just offside. The ball began with the Dortmund centre backs, who were given a ridiculous amount of time and space. 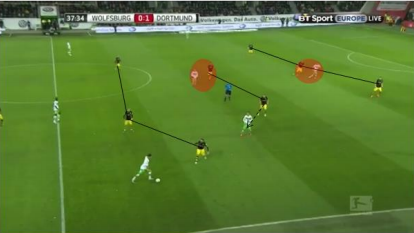 The Wolfsburg midfielders then initiated the press in when the ball reached the two Dortmund 6s, which created space in front of the back 4 for Aubameyang whose rotational movement with Mkhitaryan allowed to him to find space between the lines almost undetected. 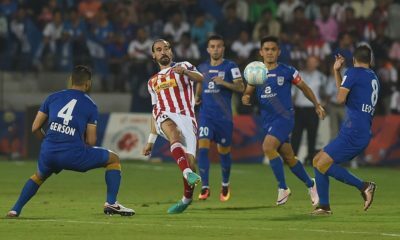 Both sides were intent on winning the ball in the opponent’s build-up phase and it was very rare to see either of them in a deep defensive block. Dortmund set up in a staggered 4-3-3 formation with Aubameyang leading the press and Reus and Mkhitaryan deeper applying pressure to the next line of play. The shape was effective to an extent in that it denied Wolfsburg the ability to play into the next phase centrally and on numerous occasions during Wolfsburg’s build-up phase they were obligated to play out wide. What was worrying though was the lack of access to the full-backs, due to the narrowness of the BVB wide men Reus and Mkhitaryan. 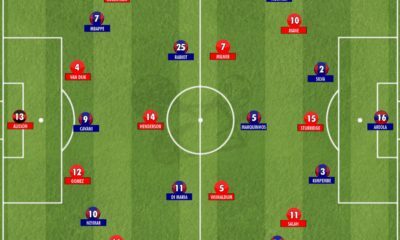 Had they decide to occupy the half-space instead of positioning themselves centrally, Wolfsburg would have found it much more difficult to progress to the next stage of the attack. 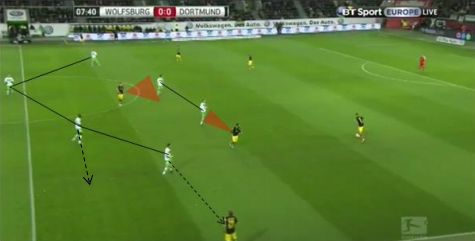 A very flexible man-based zonal marking system was set up by Dortmund when in the midfield third. 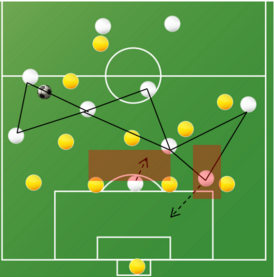 The 4-3-3/4-2-3-1 shape was maintained to an extent, however players within the block always ensured that they covered a Wolfsburg player aiming to drift between the lines and players were able to deviate from their position within the block to press the man in possession. 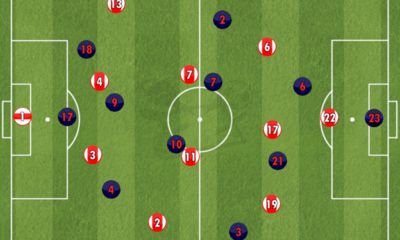 It was a system which was centred very much on regaining possession as opposed to just halting Wolfsburg’s attack. 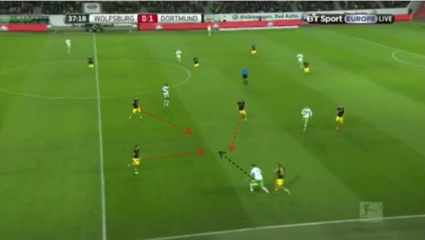 Wolfsburg’s shape was markedly different to Dortmund’s with a defensive diagonal deployed in midfield. 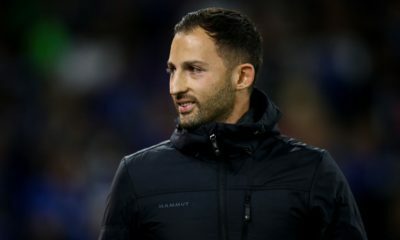 Caligiuri is in the right half-space and has access to Schmelzer but cover is being provided by Guilavogui should Schmelzer beat Caligiuri on the left hand side. This defensive diagonal also resulted in considerably less space between the lines for the Wolfsburg attacking midfield three. 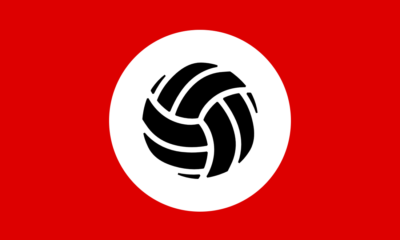 What was also intriguing was the passive nature of the Wolfsburg front two. It was rare to see them apply pressure on the Dortmund centre-backs, Bender and Subotic who were able to play multiple long passes in behind the Wolfsburg back line as a result of the strikers’ passiveness. 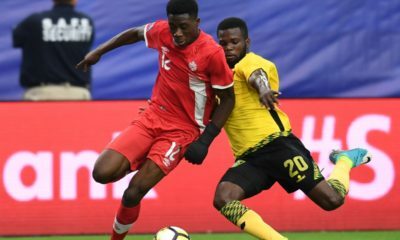 They instead looked to crowd out the Dortmund 6 space, ensuring that they were unable to play through them and would have to resort to long hopeful balls. This may have been the reasoning behind Tuchel’s decision to field Bender at centre-back instead of Ginter, who played in defensive midfield, Bender’s natural position. 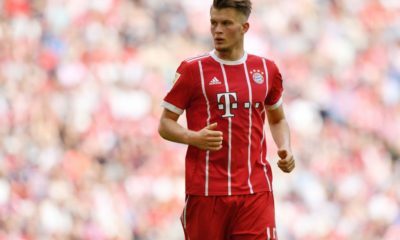 With the Wolfsburg strikers electing not to apply pressure to the centre-backs, Bender, a competent ball-player (90.1% pass completion this season) was afforded plenty of time to pick out penetrative runs from the Dortmund attackers. 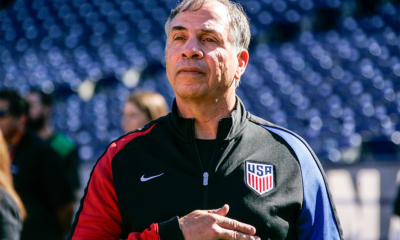 For Dieter Hecking’s side, there is ground to make up on Borussia Dortmund and the rest of the top 4. 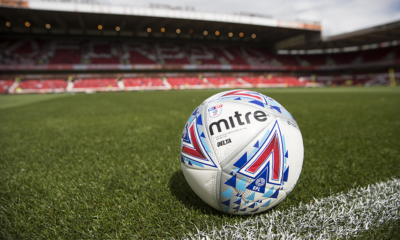 After keeping pace with the men from the Ruhr for much of the season, the Wolves must recover quickly if they are to ensure qualification for next season’s Champions League. A pivotal away victory for Dortmund to close the gap on Bayern Munich to just 5 points, all this despite being without three key players. 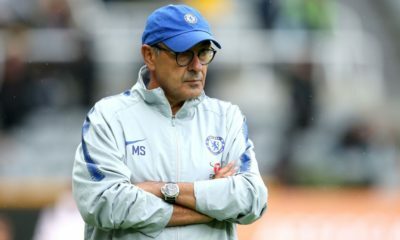 They will do very well to be able to keep up with Bayern till May but should they stay relatively injury free and maintain consistency, we may very well have a title race on our hands for the first time in a long time.